This is my first path tag that I have designed, and I have made it to celebrate my first cache that I have put out. It took me nearly 250 cache finds before I had the confidence to put one out, and now that I have I am really excited. 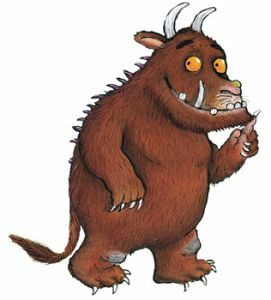 We based our cache on my sons favourite story book 'The Gruffalo'. It really is a fantastic childrens book that makes me and my children smile when we read it. "He has knobbly knees, and turned out toes, and a poisonous wart at the end of his nose." I have only ordered 50 of these coins and I will trade some, but I have made it mostly as a gift to some of the people who do my cache and to give back to some of the people who have happily given me some of their path tags.